"A-Are you going to hit me with that..?" "A-Are you going to hit me with that..?" "We are destroyers, not saviors, but I want to be a destroyer that saves." "We are destroyers, not saviors, but I want to be a destroyer that saves." The above info came from Jessica Lee, and was edited by yours truly (contact me). The image came from imageshack. Allen was abandoned when he was a baby by his real parents due to the fact that his arm was deformed when he was born. A traveling entertainer named Mana found him on Christmas and adopted him. However, Mana became ill and died around when Allen was 12. In his grief, Allen enlisted the help of the Millennium Earl. The Earl created an akuma form of Mana, but ordered him to kill Allen. Mana cursed Allen after slashing his eye. Allen's left hand became a giant weapon and destroyed Mana. 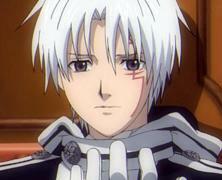 Allen was then found by General Marian Cross, who decided to train the boy to become an Exorcist. Three years later, Allen joins the Black Order (after a very gruesome training period). At the Black Order, Allen learns of a substance called "Innocence", which was used to defeat the Earl after his last attempt to destroy the world. Now Allen has joined the search for this substance with the help of fellow Exorcists. Allen's left arm contains a piece of Innocence, thereby branding him as a "parasite type" weapon. His arm can also become a combination of a gun and sword. I get this question a lot. well, let's see. they're really silver-gray. If they look blue or red in some color pages, that's just Hoshino and his editor having fun. But i hear that my eye color was recently finalized as silver-grey. The above description came from Sarah, and was edited by yours truly (contact me). Allen Walker was born with an arm that had a piece of Innocence in it. He was abandoned because of that, and was found by Mana, who raised him as his own son. When Mana died, Allen met the Millennium Earl, who offered to revive him. Mana came back, but he was in the form of an Akuma, and the Earl ordered him to kill Allen and wear his skin. Allen's anti-Akuma weapon reacted on it's own, and destroyed Mana, but the Akuma laid a curse on his left eye that allows him to see who's an Akuma, but forces him to see a living nightmare. Allen was then taken as an apprentice by Cross Marian, one of the generals of the Black Order. He vowed to save every Akuma who lost their souls. Allen is a very kind boy, who often tries to solve things peacefully. However, suffering years with traumatic debts that belong to Master Cross, he gained a 'black' personality: an aggressive, avaricious being who refuses to lose at gambling. To assure this, he improves his cheating skills. 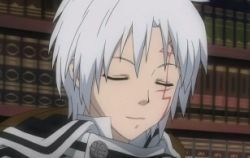 Allen is also very close to Lavi and Lenalee, and gets along well with everyone, except for Kanda (who he is afraid of, and who calls him 'beansprout'). The above description came from Sandoishi Sondasho, and was edited by yours truly (contact me).